So Maybe Charity Does Begin at Home? The breaking story written by Jay Bookman in the Atlanta Journal-Constitution was just too good not to post and follow. As many of us already know, the National Football League (NFL) and its owners have taken advantage of any and every opportunity to rake in the money. Whether it is by not paying people (from denying retired players their earned benefits to making all of their Super Bowl halftime acts perform for free) or just good old-fashioned tax evasion, they continue to exploit every single loophole to make sure not one dollar goes to anyone else. 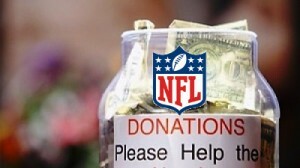 So it was no shock to see this detailed article on the recent disclosure that the NFL is…a charity. An official nonprofit charity actually written into Federal Law that makes them completely exempt from federal taxes. Are we even surprised? And, just how does that antitrust exemption work for an organization that is already supposed to be a legally declared nonprofit? How about the team doctors who pay to work for each team? Do sponsorship fees from Riddell and Pepsi and Bud Light actually count as charitable contributions? Would that make Bert Bell/Pete Rozelle Retired Football Players Retirement Plan the charitable arm of this great nonprofit? And does this mean that Jerry Jones gets to write off his expenses in hiring his son-in-law to clean his glasses? So after all these years, now we finally get it. The NFL is actually a philanthropic nonprofit and the National Football League Players Association is a real union. We are all brain-damaged and it took this long to understand everything. Read the rest of Bookman’s article in the Atlanta Journal-Constitution – click HERE. Turns out there was an article written back in March 2012 discussing the question “Can a nonprofit also have antitrust exemption?” You can read that article on SportsFan.org – click HERE. Dave Pear is a former NFL defensive lineman who played from 1975-80 for the Baltimore Colts, Tampa Bay Buccaneers and Oakland Raiders, who he helped to win Super Bowl XV in 1980. He now writes Dave Pear’s Blog, a leading advocate for NFL veterans and issues affecting them. You can reach Pear at contact@davepear.com.